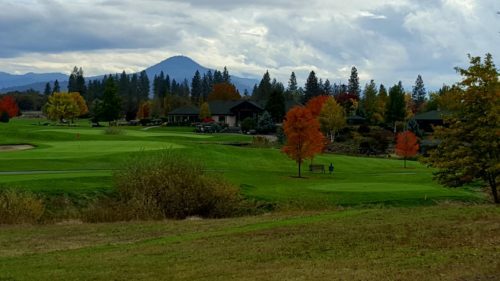 With world class golfing the Eagle Point Golf Club provides a number of additional options for everyone. 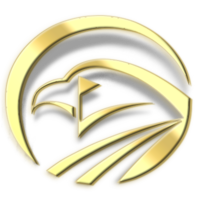 Featuring great overnight accommodations at the Chalet or spend your evening dinning at the Talon Grill, or if you looking to host a private event, the gold club is a great place to meet all of your needs. Golf Course- This spectacular layout was created in 1996 by Robert Trent Jones Jr. Some of the features are four sets of tees, whit varying distances from 5,091 yards to 7,099 making it a perfect course for both rookies and the seasoned pros. Lodging at the Chalets- These condo style overnight retreats make for a terrific place to lay your head. With amazing amenities, and one and two bedroom suites available you wont regret booking a room as all the views are right on the green. Dining at the Talon Grill- A fantastic venue for lunch, breakfast or dinner the Talon Grill uses the freshest ingredients and takes pride in their food and service. Known for their gourmet burgers, they host a wonderful selection of local, seasonal and regional craft beers and wines to pair with your meal. The Resort at Eagle Point also hosts full venue rentals for weddings and corporate events and catering options. Located at 4,600 feet elevation in the Southern Oregon Cascades. A truly beautiful setting in pristine old growth forest at the foot of Mt. McLaughlin (9,495 ft). The resort offers 11 cabins for lodging, 45 full hook-up RV sites, electric-only sites and no hook-up sites for tenting. Shower and laundry facilities for our registered guests. 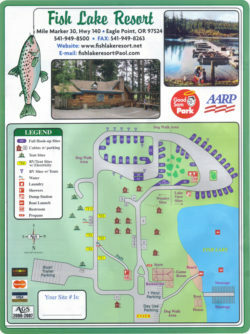 Fish Lake Lodge offers a general store, game room & the Tadpole Cafe. Boat rentals and mooring on a lake with a 10 mph speed limit helps make for a peaceful, relaxing stay at the resort. Or, if fishing is not your thing, how about great mountain biking or hiking trails. 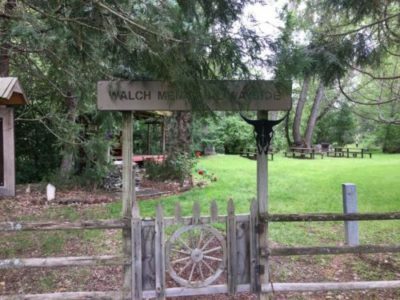 The resort offers 11 cabins for lodging, 45 full hook-up RV sites, electric-only sites and no hook-up sites for tenting. Shower and laundry facilities for our registered guests. Located at 4700’ elevation Fish Lake Resort sits at the foot of majestic Mt McLaughlin (elevation 9,495’). This is a great day hike if you are up to a challenge. For those who like a more leisurely hike you can stroll on the miles & miles of other trails that lead out of the resort. Fish Lake Trail: 2 ½ miles of down to the dam. Brown Mountain Trail: A challenging trail that goes for miles but has several shorter loop trails that are great for hikes with young children. Fish Lake Resort cabins are available 365 days a year. Bring the whole clan & book our big cabin (sleeps 8) for the holidays or just a snowy weekend). Cabin 1 has a romantic setting with a great view of the lake. Be sure to book early as we can often get busy. 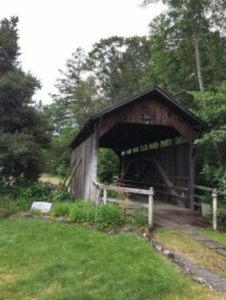 This queenpost-style 39 ft. covered bridge is no longer used for traffic, but can be enjoyed by anyone willing to take a drive to see it. Built around 1881 (some records say 1874 or 1919! ), it is one of four remaining covered bridges in Jackson County, Oregon. It’s well-maintained and can be reached by taking Hwy. 140 east from Medford, then Lake Creek Road to Lost Creek Road. If you like covered bridges, you’ll like this one, too. Adjacent to the bridge is a park that can be used for picnicking.